Whenever a process or a running program freezes, we launch the Task manager, find the process, right-click on it and select End Task to kill it. As much as the process is known, at times it doesn’t help. You could click on End Task but it wouldn’t respond. Perhaps, the instruction given to the system was not sufficient to force end the task. Obviously we know it wouldn’t work. Why else would we try to use the Task manager to try killing the process. But let the system catch its breath in a while and try again. Should it work, you might consider uninstalling the program especially if it is a redundant freeware. The Taskkill command in Command Prompt is similar to the End Task option in the Task manager. However, the difference is that it won’t be affected even if the system is slow and we could “force” this command. 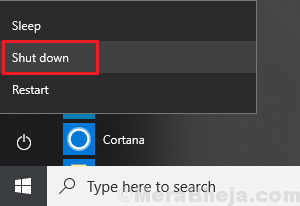 1] Type Command Prompt in the windows search bar and when the icon appears, right-click on it and select Run as administrator. Where <name and extension of the process> is the name and extension of the process. Eg. It would be notepad.exe for Notepad. /F is added at the end if the syntax to force the command. While the command should be helpful, in the rare case that it doesn’t work, we could try the following solution. 1] Click on the Start button >> the power symbol >> Shut down or restart. 2] Click on OK for any warning indicating unterminated programs. If the system is too slow to be shut down in this manner, use the Power button to shut it down forcefully.